Gosaikunda Trekking Tour presents very good value with excellent lodge accommodation and food. Gosaikunda Trek or Gosaikunda tour is less crowded trail compare with other popular trekking and hiking routes in Nepal. Furthermore, langtang area is a home of several wild animals such as Musk deer, Himalayan black bear, snow leopard, Himalayan wild goat and particularly birds and wildflowers. During the springtime, Gosaikunda Trek covered with varieties of alpine wildflowers and the forests are multi-colored with colorful rhododendron, orchids, magnolia, and many other floral species. Moreover, you will have the best view of Mt. Ganesh Himal family, Mt.Langtag lirung (7,246m), Langtag-ri, Langsisa peak, Langtang Himal, Ganjala peak from Gosaikunda Luribina la viewpoint. You can reach Gosaikunda on your journey but it is more challenging to ascend. Gosaikunda or gosain kunda is a holy lake, an important pilgrimage destination for Hindus and Buddhist pilgrimage people. You can ascend up through more forests to the famous Gosainkund Lake to set among in high grey rocks. Gosaikunda pilgrimage trek can be done at any time throughout the year. It is a classical trek itinerary compared to most walks in this region leading up to the glacial pristine lakes. The particular route is designed for world travelers who wish to hike to Gosaikunda glacial lakes but are walking in a more relaxed manner than take a look at this itinerary. Upon arrival in Kathmandu, Tribhuwan International Airport, we will receive you with private vehicle and transfer to hotel in Kathmandu within B/B plan. Our representative will give you trip briefing. Have a breakfast at the hotel, drive few minutes to catch up coach for dunche Bazaar with your mountain trekking guide and porters. Enjoy seven our scenic drive through Trishuli bazzar with beautiful small villages, river valley and mountains. The bus stops roughly about 30 minutes on highway restaurants for lunch in Trisuli. You can reach at Dunche bazaar around 2 or 3 o’clock midday. Stay overnight at lodge. We leave Dunche Bazaar than the trail slightly goes uphill through beautiful rhododendron, Bamboo and pine trees. During the journey to Cholang pati you will pass several tiny villages with local guesthouses. Chandran bari also known as sing gomba offer a best YAK cheese factory than continue your journey about 1 hour further, you can reach Cholang Pati where you can stay overnight at guest house. As you ascending towards Lauribana la than you will have almost the best and brilliant view of Langtang Himalayas such as Langtang Himal, Ganesh Himal, Tibetan Mountain and forests of Oak, Hemlock and Firs forest and beautiful landscapes. Then we walk to Gosaikunda (4460m.) via Lauribinayak La (3920m.). We would follow a rugged trail with dramatic views of Himal Chuli (7893m.,) Manaslu (8156m,) and Ganesh Himal (7406m.) in a close distance. 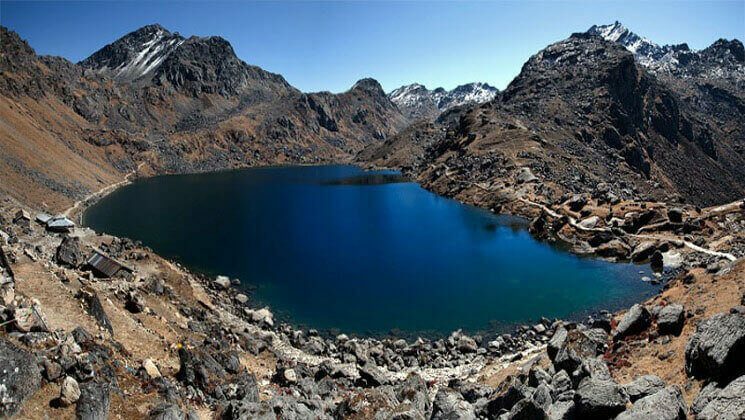 At Gosainkunda, we can see a dozen of beautiful lakes. Moreover, the major three are Saraswati Kunda, Bhairab Kunda, and Gosain Kunda. According to a legend, Gosainkunda was created by Lord Shiva when he pierced a glacier with his trident to obtain water to quench his thirst after having swallowed poison. Today, we walk downhill from Gosainkunda to Sing Gompa (3250m.) passing over the most popular viewpoint. Our trail descends downhill walking all the way to Sing Gompa passing Lauribanayak hill station. The view from here is just outstanding. Furthermore, walk through the jungle while going to Chandan bari. We find a nice lodge with a local cheese factory and a Buddhist Monastery. The first part of the trail descends through pine, silver oak and rhododendron forests with marijuana (gaja we call it in Nepali) plants up to suspension bridge over the Sing Gompa Stream. From this point, our path goes even through some human settlements and reaches Dhunche bazzar, the headquarters of Rasuwa district. How much does Gosaikunda Trekking Tour cost? Hike to Gosaikunda is available now on USD 499 per person is standard trek price on double occupancy basis. But of course, the trip price will vary according to group size. Meals on full board (breakfast, lunch, Dinner) each day during the trek. We can arrange private pilgrimage Gosaikunda Trekking Tour starting at any date that works for you. Please contact us for more information. Question: Do I need the experience to do express Gosaikunda Trekking Tour? Question: What kind of accommodation can I expect on Gosaikunda Trekking Tour? Likewise, Dinner and breakfast are provided in the same lodge you spend the night every day and Lunch will provide on the way to the next place where you are going. Question: What opportunities will I have for shower along Gosaikunda Trekking Tour? Question: How do I get drinking water on Gosaikunda Trekking Tour? Answer: You can buy bottled mineral water into the lodges or tea shops on the trek but however we advise against buying mineral water in plastic bottles, as currently there are no provisions for disposing of these. Instead, we provide you with boiled water or bringing chlorine tablets to purify the normal water as the normal water is available in campsite/along the way. Answer: In Gosaikunda lodge basis trek there will be more chances to charge the battery. We recommend you bring an extra pair for in case. Remember to bring your adapters! Question: Is there any communication facilities on express Gosaikunda Trekking Tour? Answer: Yes ! you can get telephone reception as well as internet services. So we recommend you to buy a local Sim card either N CELL or NTC. Question: Who will carry my luggage on the Gosaikunda Trekking Tour? Answer: You can allocate US$ 08 – 10 for a lunch/dinner in Kathmandu and it depends on your spending habits. US$ 7 to 10 US$ each day is enough to buy bottles of water, chocolates, tea coffee, and some drinks while you are on trek. Discover langtang Himalayas within 360 deg angle from Lauribuna la view point. Gosaikunda a pilgrimage destination of Hindu devotees, located at 4,380m above sea level. Best company, professional guides, best experience. My husband and I trekked to the amazing Langtang gosaikunda scenic trek in October 2016 with Umesh our guide through Gokyo Treks and Expedition. Ammar organised everything for us with perfection. We stayed at Ammar’s home after arriving in Kathmandu. What a nice welcoming, feel like family. We had an amazing time with our Trek guide Umesh who has almost 20 years experience trekking all over the Himalayas in Nepal. Pictures can not give back the natural beauty of the Himalayas. It was amazing to be in the nature far away from civilization. The trekking was hard but it was well worth the effort when we reached the amazing langtang Himalayas. All the villages had simple tea houses and plentyful food options. Thank you very much Ammar and Umesh for the amazing experience ! – Esther Deak, Melbroune Australia.